MDriven Framework– the model driven framework for .net. A tool for creating model driven, multi layered applications. 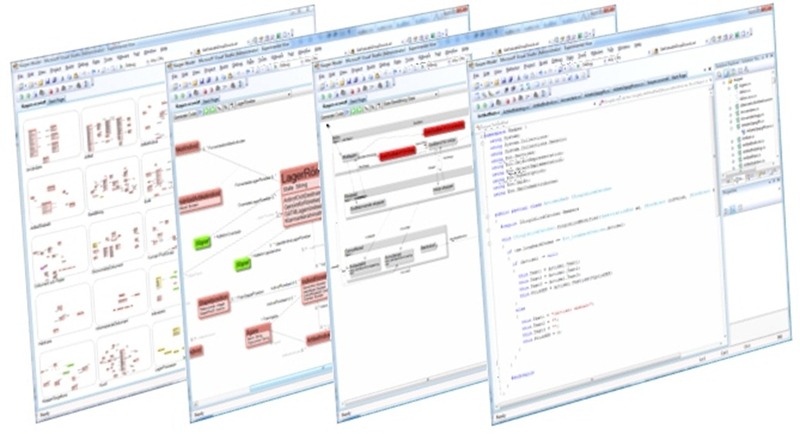 MDriven Framework – Contains a lot , MDriven Designer the UML modeling tool, Database derive from model , Code derive from model. Change the Model and watch the code and database follow your every whim in matter of seconds – while keeping your data and additional hand crafted code. One word that describe MDriven Framework could be Fast, but it could just as well be Quality – since using a consistent framework is key to get quality on time. But if we need to choose we will be forced to say Maintainability – being at the correct level of abstraction when tracking a changing business is soothing for all you code warriors out there. Have you ever wondered how things will be done in the future? I mean surely mankind must reach some acceptable consensus on how the internals of an information system is built at some point. When that consensus is in place there must be people that once and for all implement a tool that follow the rules stipulated. A tool that expose all the useful degrees of freedom and simply absorbs and hides all the non productive degrees of freedom (I am talking about bugs). We are convinced that this will happen. In fact we are so very sure because the future is already here. Take our MDriven Framework product for a test spin – Set yourself in the Model Driven Architecture driver´s seat today and feel the freedom it gives. Forget about projects that require 100 men. Use your ability with our tools and you will never want to go back to your old ways. Raise the quality and agility in everything you do from now and onwards. MDriven Framework makes you run circles around the fastest requirement changing clients in the world. Now you can finally leave the cul-de-sac of overseas outsourcing once and forever. This is the tool that puts you back in control. It gives you the power to take your ideas and make them real. Today. MDriven Framework in its core is UI agnostic. Still we include declarative ViewModel engines for WPF, MVC, WindowsStore, Silverlight, ASP.NET and Windows forms. MDriven Framework has templates and can update code for C# and VB.NET. MDriven Framework has several domain driven runtime features that optionally can be used in your applications. Examples are a full domain layer undo & redo stack, Versioning of specific classes and Declarative Action definitions. MDriven Framework supports a lot of databases through the clean and straight forward PersistenceMapper interfaces. You can easily create even more but the ones we offer now include SQLServer, Oracle, MySQL, Firebird, Mimer, NexusDB, SQLite, Blackfish, Sybase and then some. MDriven Framework will derive the database schema, the code for the domain classes, and the information for mapping the classes to the database tables. And better yet, when you change your model, MDriven Framework will merge the changes into your code, and update your database schema while preserving your precious data. A feature we refer to as Database Evolution. Could I use the current version of ECO on Visual Studio 2010? I d’ like to get clear. It means I can just use //www.capableobjects.com/xdownloads/EcoSetup_6.0.0.6922_Nightly_vs2012.exe on VS 2010 or I should to use //www.capableobjects.com/xdownloads/EcoSetup_6.0.0.6969_Nightly_vs2010.exe? Great article, very informative today I am learned about the new tool of dot net is Model Driven framework. the web application we have few sets of actions which are always executed in the series of actions. Rather than writing those actions again and again in our test, we can club those actions into a method and then calling that method in our test script. Modularity avoids duplicity of code.